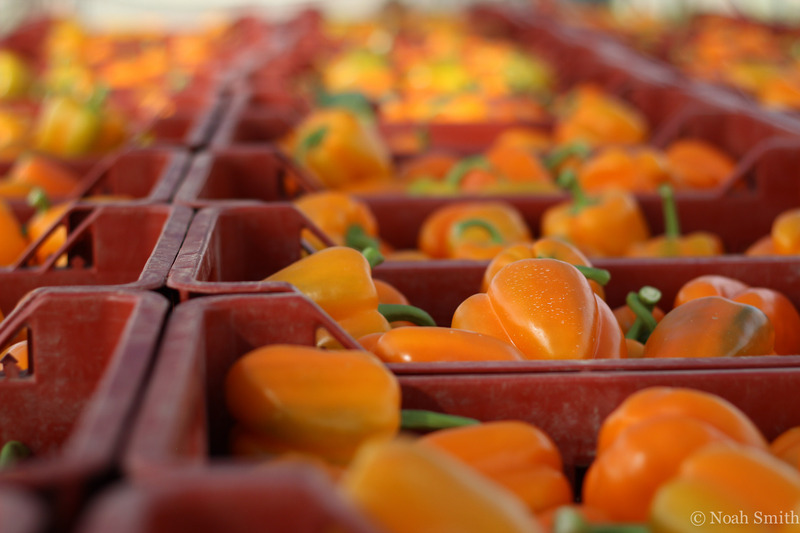 Orange peppers ready to be packed and shipped to European markets. 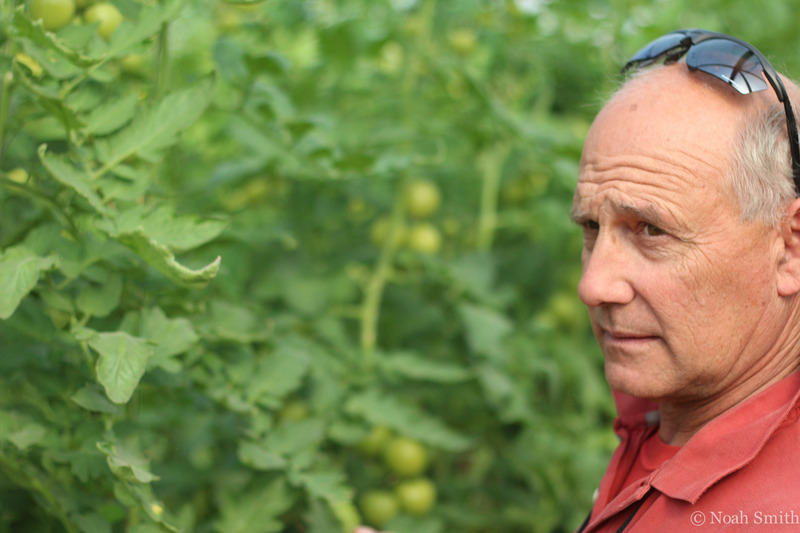 Dan Becker, of Hatzeva, gives a tour of his fields. 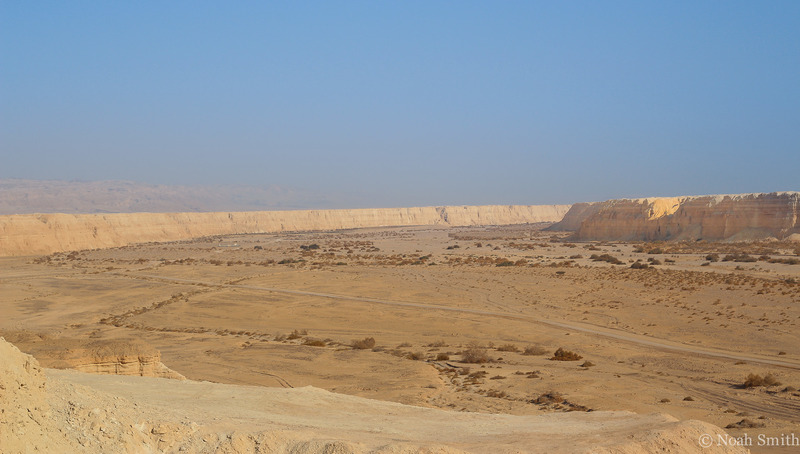 A 5-minute drive from the moshav, the cliffs on the right are in Jordanian territory. Inside, Thai workers pick peppers. Despite the heat, they wear clothing that covers all of their skin, for cosmetic reasons. Mr. Becker explains the delicate balance necessary to successfuly cultivate crops in the biblical desert. 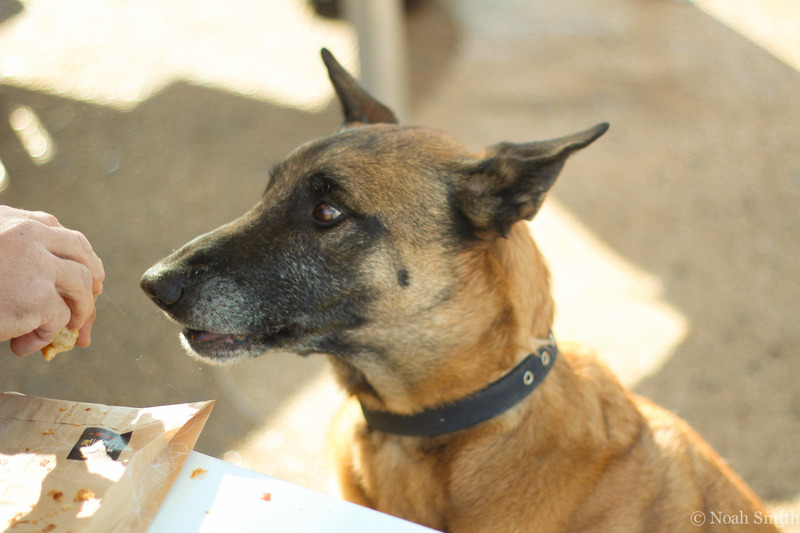 Toby, a retired military dog, keeps watch for fallen peppers..
Toby enjoys an Aroma Cafe croissant. The cafe owner was upset that his food was being given to a dog. Toby is an older dog now, but his appitite remains strong. 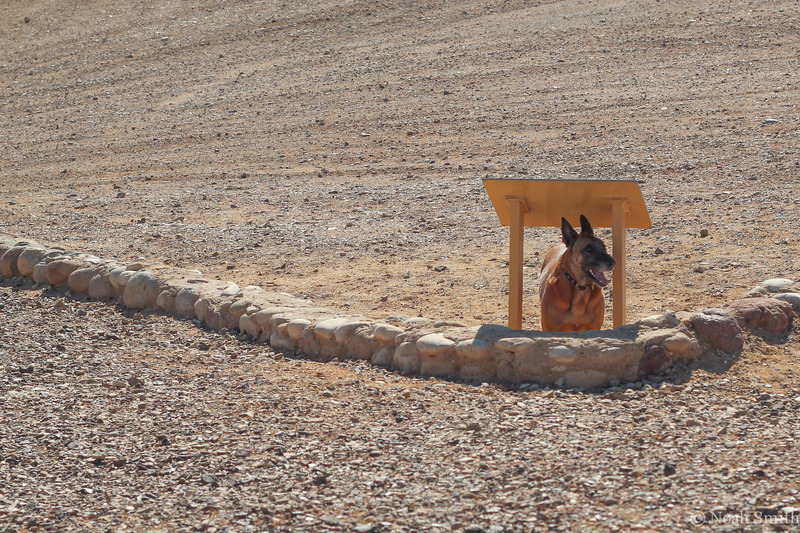 Toby, trying to find some shade from the harsh desert sun. 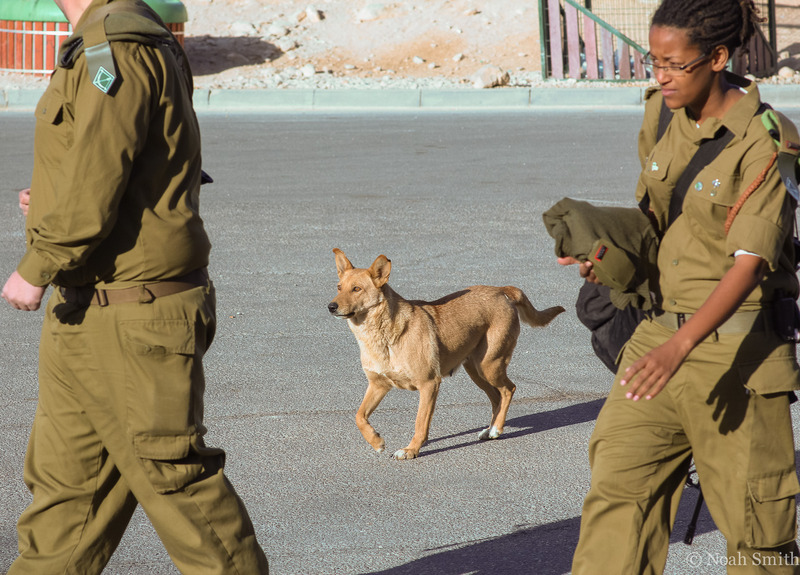 The Israeli military uses dogs for a variety of purposes. 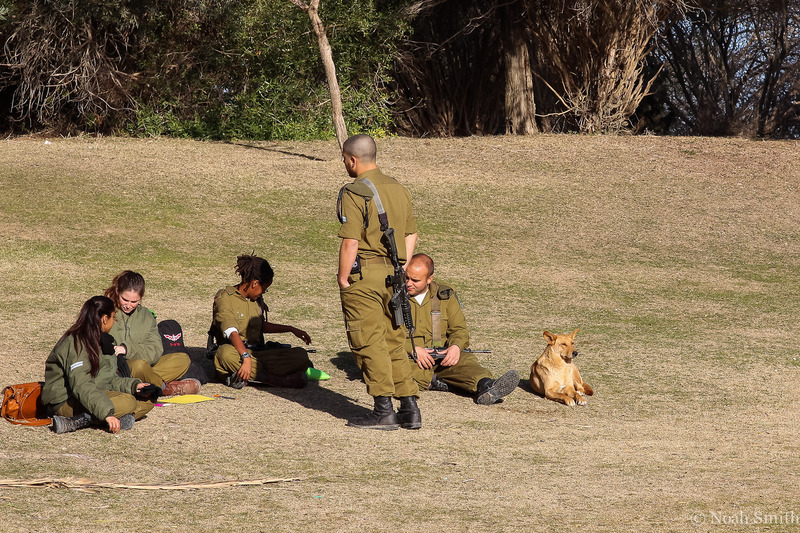 The dogs, and their handlers, are attached to a wide array of units. 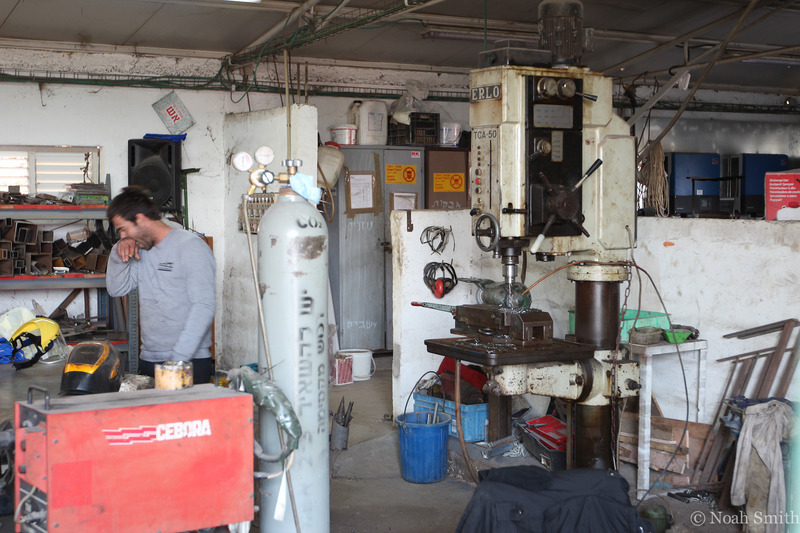 A welder takes a break in a workshop on the edge of the moshav. Welding and other metalwork represent one of Hatzeva's few non-agricultural businesses. 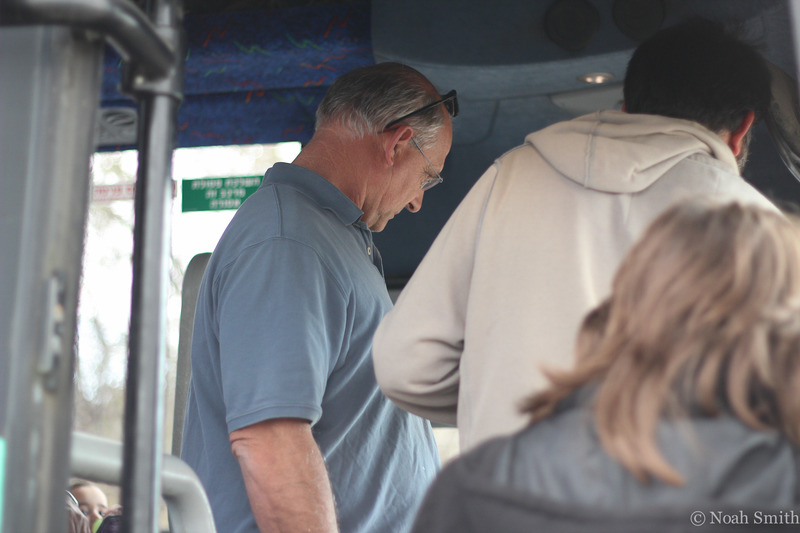 Mr. Becker negotiates with the bus driver, trying to get him to accept passengers who do not have a reservation. The bus driver refused. Life in the desert is hard, sometimes in unexpedted ways. 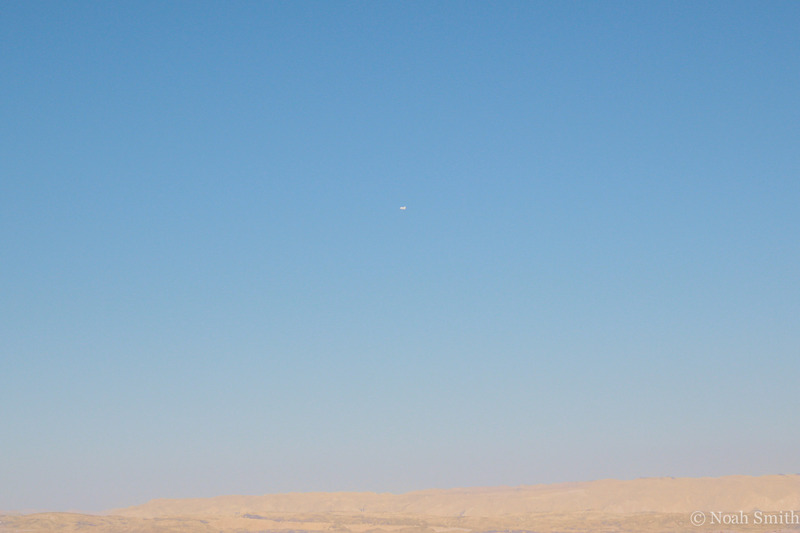 A blimp, visable from Hatzeva, floats over the Israeli city of Dimona. Dimonia is widely thought to be the location of some of Israel's nuclear arsenal. 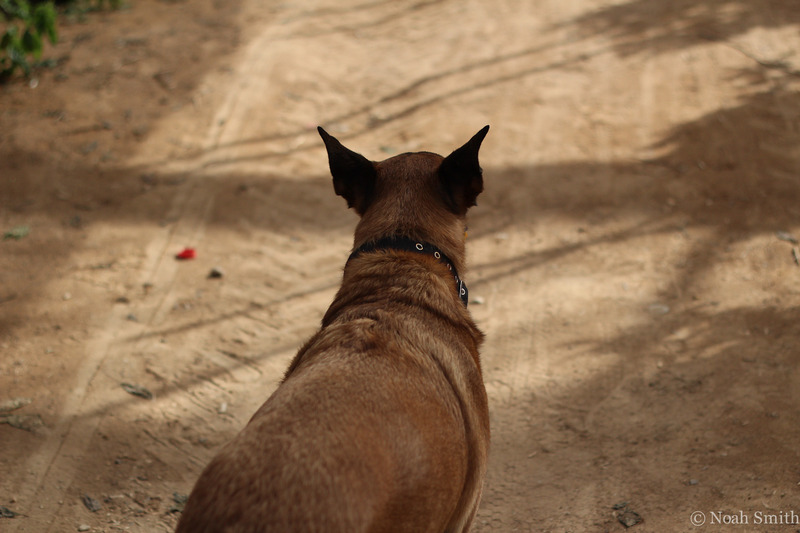 Theft from Bedouins was once a problem, though today a bigger issue is pests. The buckets on the fence represent a failed attempt to use bees to prevent bug infestations in crops. 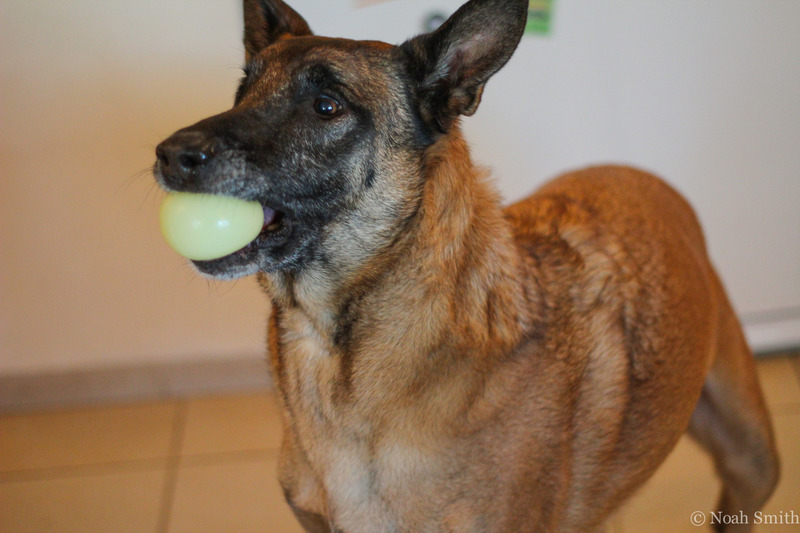 Toby, playing fetch with his favorite ball. 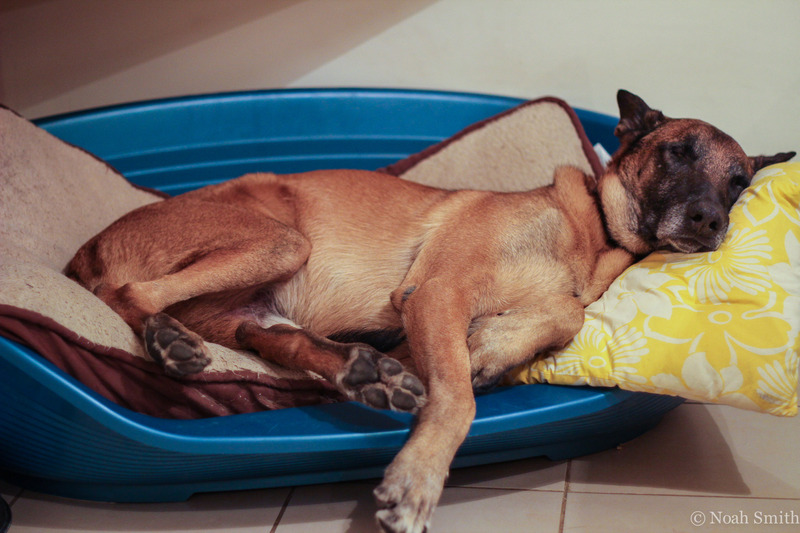 Toby, after a long day. "We are just one bad crop away from being in a lot of trouble," explains Dan Becker as we walk through one of his greenhouses, accompanied by Toby, a retired military service dog. Such thin margins of error are the price tag of trying to cultivate crops in the middle of the, literally, biblical desert. 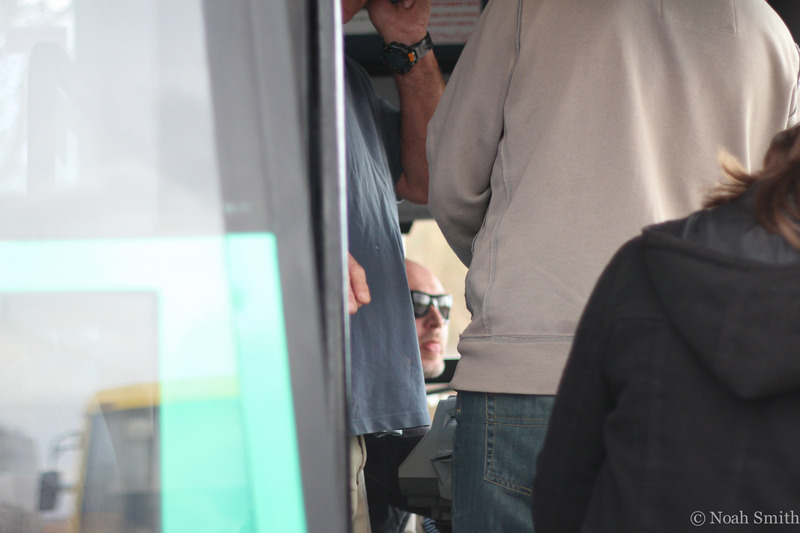 Mr. Becker lives in Hatzeva, a small Moshav community situated in the Negev desert, right on the Jordanian border. 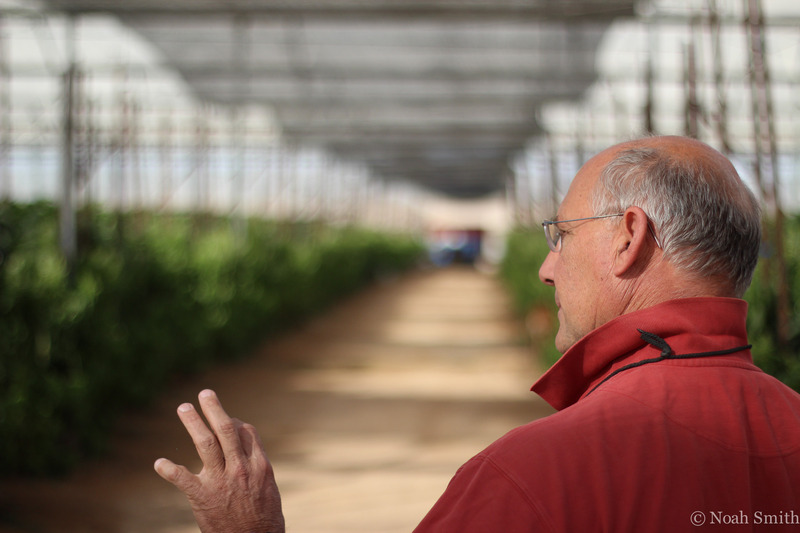 A Moshav is an agriculturally-based community in which residents work together and collectively share many of the costs of community life. Driving to Hatzeva, one must descend into the Arava Valley. Upon beginning this drive, the traveler is treated to dramatic, sweeping views across the valley. Across its wide vistas, the entire landscape seems utterly incapable of sustaining anything beyond the paltry, scorched bushes interspersed among the dirt, sand, and rock. And yet, it is from this very region that a good many peppers in European supermarkets originate. At a local trade expo held earlier this year, representatives from Walmart (USA), Okmarket (Russia), Haluco bv (Netherlands), Keelings (Ireland, UK, EU), Fozzy group (Ukraine), as well as other international importers and distributors were in attendance. According to the event organizer, the Mashov Group, deals worth "millions of dollars" were signed. It is incredible. 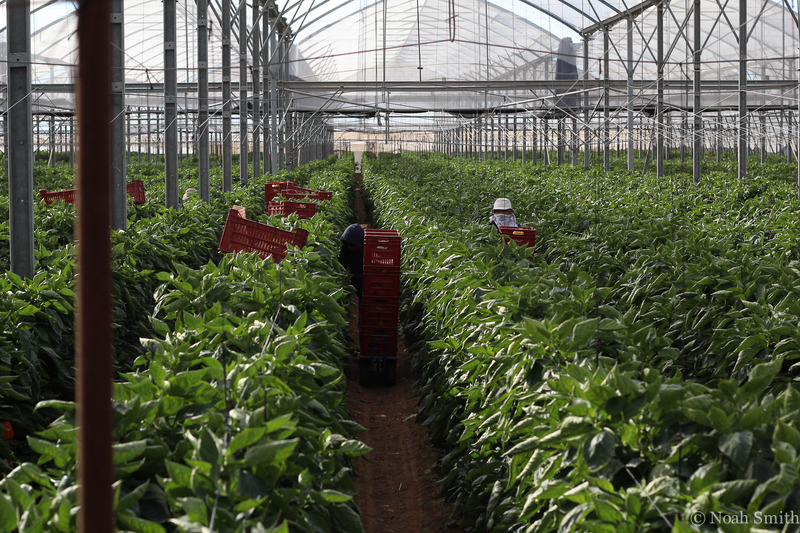 To Mr. Becker, it is even more incredible, given the extremely low threshold for error in growing peppers anywhere, much less in the Negev. "The temperature, moisture, heat and sun, all have to be kept at the right levels," he explains. "We also have to look out for diseases and for the best time to pick the peppers, so that they don't spoil." 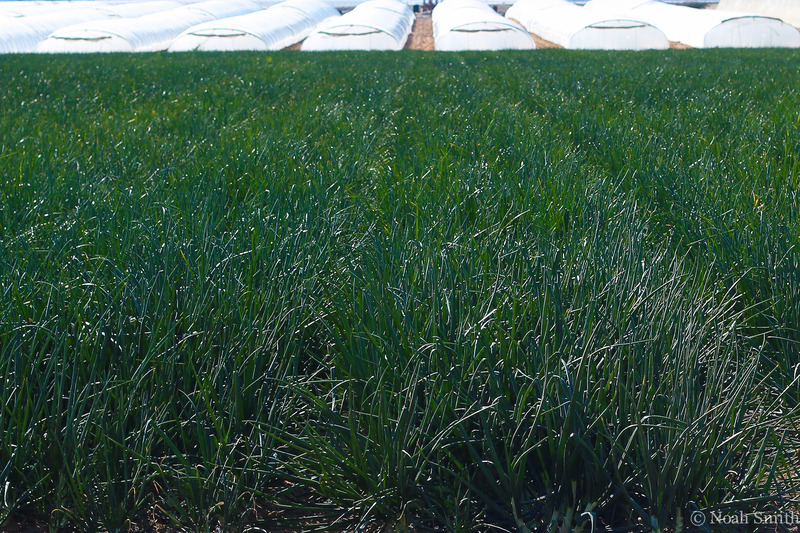 While it may seem that these would be concerns for any farmer, and they are, the difference in Hatzeva emanates from land, available resources, and lack of almost any kind of environmental support. Due to the high cost of sustaining the greenhouses necessary to grow peppers in such a harsh environment, Mr. Becker is only able to plant a limited amount of peppers. 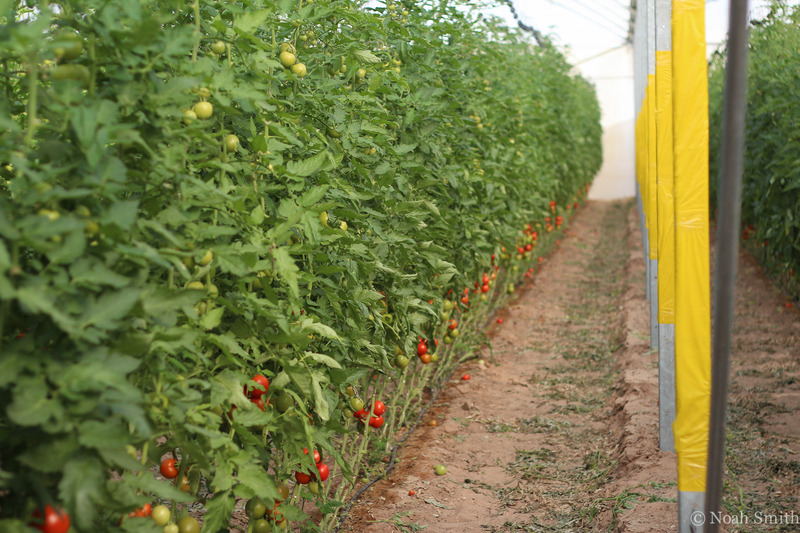 The sun and heat- and in the winter the cold at night- are often too extreme for the peppers, which must be shielded. Rainfall is obviously meager, at best. Even if the peppers are in ship-shape, though, other factors come into play. Most notably, the cost of peppers on the market. Like other commodity markets, the price derives from complex exchanges in places worlds removed from Hatzeva. Mr. Becker and other local farmers have little pull when it comes to negotiating prices and must simply try to produce the best quality produce possible and hope the market for them is strong. The labor on Mr. Becker fields, and indeed most of the fields owned by residents of Hatzeva, is undertaken by a contingent of Thai migrant workers. Generally, they work in Israel for one year, during which they receive pay and agricultural-based training. However, few of the Thais speak English and almost none speak Hebrew. Communication is often a problem as are differing cultural expectations. The gap seems much wider than the analogous situation most prevalent in the United States. One striking example of the cultural differences can be found in clothing. Despite the intense heat, particularly in the summer months, the Thais seek to cover as much of their skin as possible from the sun. This means wearing long sleeves and pants in heat that can reach 125 degrees Fahrenheit. This is done due to their desire to keep their skin as light as possible. The desert is a rough place, and threats often come from unexpected directions. 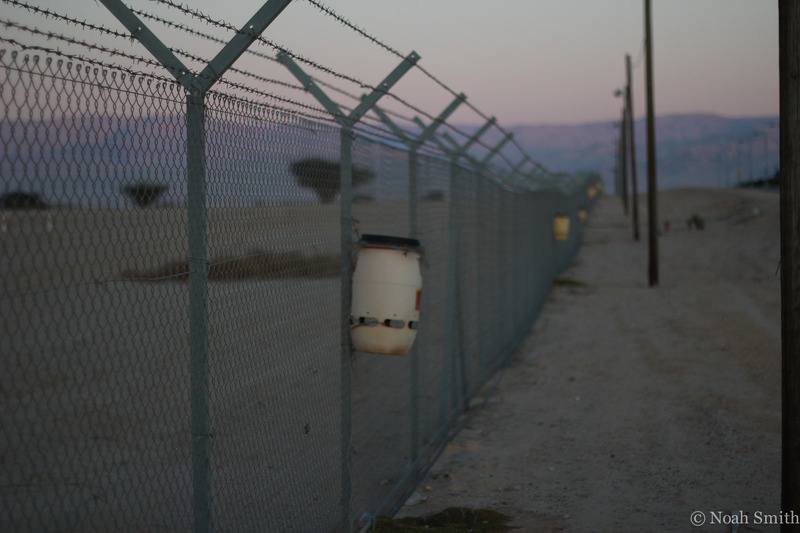 Years ago, Hatzeva erected fences and implemented a nightly watch system to protect against Bedouin thieves who would come in at night and steal crops. The threat dissipated over the years and the fences eventually became posts on which to hang experimental solutions in pest control, namely specially-bred bees from a northern Israeli town, meant to control an increasingly serious pest problem. It was unsuccessful. Within the confines of Hatzeva, despite its desert location, it is possible to feel immune from the environment lurking outside the perimeter. Homes have satellite television and high speed internet. There is a proper basketball court, swimming pool, and even a water slide. The local market stocks national and international brands. Still, one look to the northwest reminds you where you are. In the sky, above the city of Dimona, sits a military blimp, keeping watch over what Israel claims is not its nuclear arsenal. A look east, and depending on your location, south, allows views into Jordan. So why do it? Why live there? Why not find a plot in the fertile north of the country? Or even back in the U.S.? Mr. Becker is here now because it is his home. It is where he raised his children and it is where his conducts his business. Perhaps offering a view into the rationale that originally led him to this land, on one of our tours of the area, he pointed out that, "someone has to live in this area if it is going to be a part of Israel." It is unclear whether or not this grand experiment in the desert will ultimately prove to be sustainable. 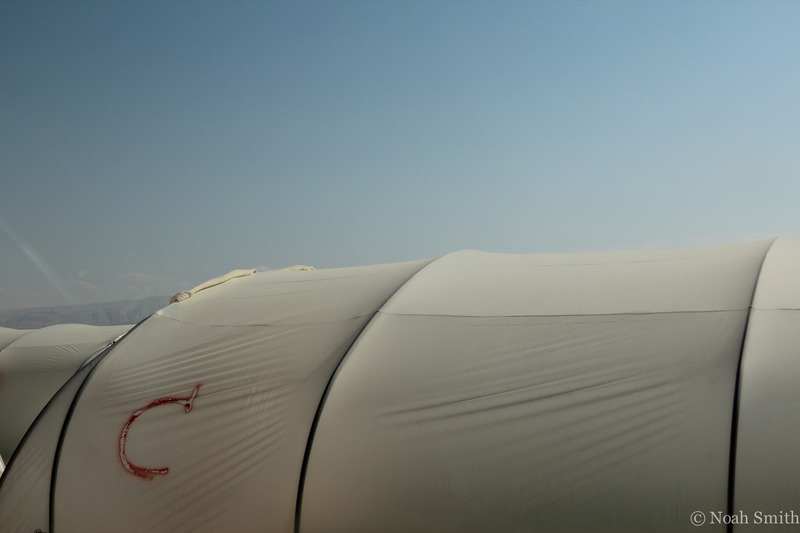 Despite the diversification attempts in regard to crops, cutting edge technology, and the extreme dedication exhibited by the farmers who call Hatzeva home, the desert is a shifting and dynamic place. The ultimate success of the enterprise will depend on the cooperation of many disparate variables, variables which are largely beyond the influence of even the hardest working men and women. As is so often the case in this part of the world.